I don't want to die a tight bud, I hope to spend the rest of my years blooming into fullness. Most days I try to stretch a little more. Sometimes it's a great big blossoming stretch like making an important phone call or committing to something new. Sometimes it's as simple as smiling into the face of another's frown. Risk and fear go hand in hand, but we can be careful not to let fear take the lead lest we freeze. Georgia O'Keeffe wrote, "I've been scared every day of my life, but that's never stopped me from doing everything I wanted to do." 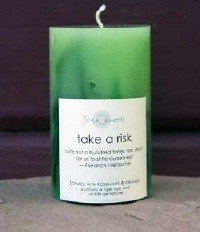 Take a risk. I dare you.